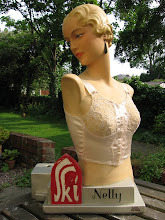 Vintage Style Mannequins: New Mannequin Range! 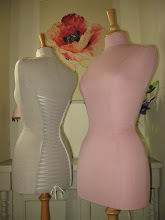 I have had lots of requests recently for vintage style mannequins to be tailored in plain fabric covers ... so, I have been a busy bee with my sewing machine! I now have a new range of plain fabric mannequins covered in a beautiful soft linen fabric from Laura Ashley called 'Austen'. The mannequins in the pictures are covered in natural and chalk pink, but other colours available are: cream, biscuit, duck egg and charcoal. Each mannequin comes with either a corset laced back finish, or a traditional tailored back finish. Stand finishes are available in natural beech, black or ivory. Please do get in touch if you have any ideas for other fabrics and types of finishes - I love a challenge!